It’s four in a row for Presence Saints Mary and Elizabeth Medical Center (PSMEMC). 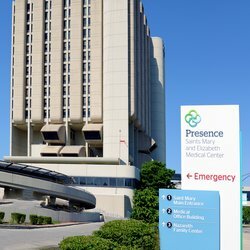 For the fourth consecutive scoring period, PSMEMC received an “A” for how well the medical center protects patients from errors, injuries, accidents and infections, according to The Leapfrog Group, an independent industry quality-assurance organization that publicly rates hospital performance. The Hospital Safety Score uses national performance measures from the Leapfrog Hospital Survey, the Agency for Healthcare Research and Quality (AHRQ), the Centers for Disease Control and Prevention (CDC), the Centers for Medicare & Medicaid Services (CMS) and the American Hospital Association’s Annual Survey and Health Information Technology Supplement, according to Leapfrog. Calculated under criteria identified by Leapfrog’s Blue Ribbon Expert Panel, the Hospital Safety Score uses 28 measures of publicly available hospital safety data to produce a single A, B, C, D or F score. The assessment indicates how well a hospital protects patients from preventable harm and medical errors, such as falls, problems during surgery, medication errors, blood clots, infections and others.